The iRobot Dirt Dog is a cleaning machine, literally. This makes a cool gift idea for guys who are looking for help keeping hard floors, shop carpets, or industrial-floor surfaces clean. The iRobot Dirt Dog Workshop Robot picks up what gets thrown down. "Command" it to clean and it gets to work sweeping under workbenches, cars, and other hard to reach places. It'll pick up the nuts, bolts, dirt, and other debris from the shop floor. When he's done working, he can leave the cleaning to the robot. iRobot Dirt Dog's oversized dust bin and high-speed, counter-rotating brushes keep his workspace clean. 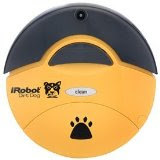 iRobot 110 Dirt Dog Workshop Robot @ Amazon.com .